If anything's giving gaming juggernauts like Nintendo and Sony reason to look over their shoulders, it's the recent uptick in mobile gaming. And much to those titans' chagrin, Nyko's come to stir the pot. Announced just today, the accessory maker's outing a new line of wireless controllers made specifically for TegraZone titles. The peripherals, co-developed with NVIDIA, come in two distinct sizes: the PlayPad Pro for more traditional gaming with its dual analog controllers, d-pad and array of shoulder and face buttons, and the diminutive PlayPad with its dual analog sliders, carrying case and foldable stand for a truer portable experience. Though both controllers are designed for use with optimized Tegra 2 or 3 titles, legacy games will also be supported via the accessory maker's free Playground app, which will also allow for customized layouts, as well as pre-sets for top titles on devices running Android 3.0 and up. No pricing or concrete release information's been made available at the moment, with the company mentioning only a Fall launch for later this year. We'll be sure to have a hands-on coming in the hours ahead, but for now, content yourself with the presser below. 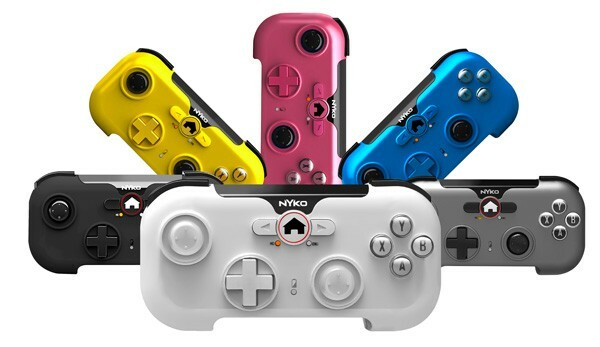 "To embrace the enormous growth of mobile and tablet gaming, our new controllers will provide physical and familiar controls to tablet gamers for a console-like experience," said Chris Arbogast, director of marketing for Nyko Technologies. "Tablet games are evolving, pushing the envelope of graphics and performance. The only limitation has been the lack of physical-input controllers, until now. We are happy to collaborate with the veterans at NVIDIA to create dedicated hardware that's optimized for games running on the Tegra chipset." PlayPad Pro – Nyko's full-sized controller for an at-home gaming experience, including dual analog sticks, d-pad, face buttons and shoulder triggers/bumpers for wireless tablet gaming in the living room. The Nyko tablet controllers are being developed with input from NVIDIA to ensure compatibility with a large library of high-end mobile games optimized for all Tegra-powered devices. These games are available in TegraZone™, NVIDIA's free app that showcases the best games optimized for the Tegra processor. NVIDIA's Tegra 3 chipset delivers console quality graphics on mobile devices with the world's only 4-PLUS-1™ quad-core mobile processor, including a 5th battery-saver core. Nyko has also developed a free Android app, called Playground, to provide backwards compatibility for their controllers with legacy tablet titles, including those that currently utilize keyboard mapping, touch mapping and mouse support. Playground provides profile management for customized control schemes, as well as pre-set profiles for top selling and popular games. Like Nyko's tablet controllers, the app will not require rooting of the device.